If there is royalty in the world of road racing, the women’s field of the AJC Peachtree Road Race has bestowed its crown on more than one queen. But sitting idly on the throne was never in the cards for Lornah Kiplagat, Grete Waitz or Tatyana McFadden, who among them have won the Peachtree 16 times and counting. Their impact extends well past any finish line, as all three have made a difference in the lives of those around them in ways that transcend the sport and prove that lasting greatness is measured by more than just the clock. We will use only the first names of these women here, because in the world of running none requires a last. Lornah, a five-time winner of Peachtree and still the course record-holder. In 2000, she put her own money into establishing a training camp in Iten for young Kenyan women to help them improve not only their running but also their lives. Grete, a four-time Peachtree champion and nine-time winner of the New York City Marathon. She pushed the limits of women’s running in its infancy and, after a cancer diagnosis, established AKTIV Against Cancer, which works to ensure that physical activity becomes a standard part of cancer treatment. 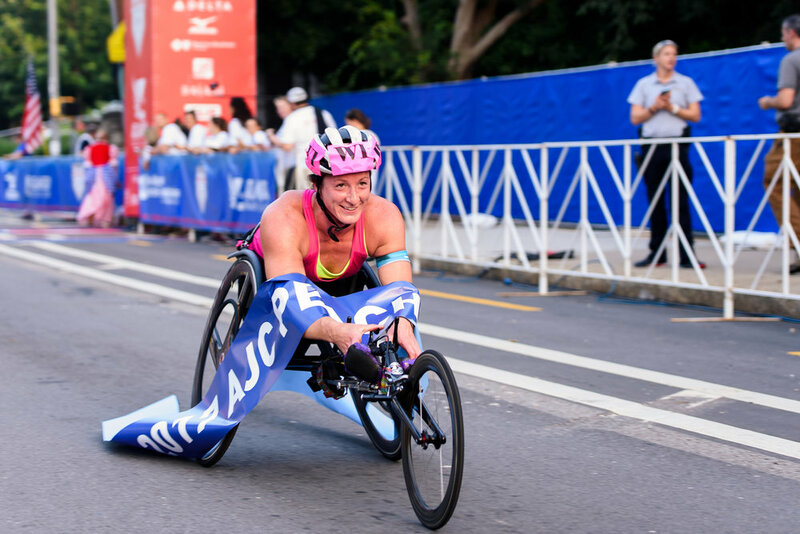 Tatyana, whose seven Peachtree victories in the Shepherd Center wheelchair division are the most of any athlete in race history. She spent six years in a Russian orphanage before becoming an activist and a devoted mentor to other athletes, especially children, with disabilities. Lornah recently called Peachtree “a monument.” The same could be said of these three athetes. She was only 23 when she first competed in the Peachtree in 1997, finishing seventh, and the next year would advance to runner-up in a close race before backsliding to sixth in 1999. But on July 4, 2000, the Lornah Era began. “I remember that it was in Atlanta that I saw fireworks for the first time in my life,” she wrote in an email recently, and at the 30th Peachtree she set off a few of her own in what was almost certainly the most-decorated women’s field ever assembled in Atlanta outside of the 1996 Olympics. Four miles into the race, she was so far ahead that she considered slowing down to make the race more of a contest. Instead, she hurtled on to set the course record, her time of 30:32 more than 45 seconds ahead of second place – which went to none other than Derartu Tulu, the 1992 Olympic gold medalist at 10,000 meters. Among the other women Lornah vanquished that day were Catherine Ndereba, who would go on to win two Olympic silver medals and four Boston Marathons, and Fatuma Roba, the 1996 Olympic gold medalist and three-time Boston winner. Lornah would win easily in 2001, too, before a 2002 three-peat saw her run with the lead men for the first mile (“I remember Martin Lel was shocked to see me running next to him”) on her way to tying her record of 30:32. In 2003, Lornah was derailed in her quest to become the first runner in the open division, male or female, to win four in a row by Susan Chepkemei, who ran on the defending champion’s heels for most of the race. After missing the 2004 Peachtree to compete at 10,000 meters in her first Olympics – her only absence in a 10-year span from 1997-2006 – Lornah returned to win again in 2005 and, despite a calf injury that nearly kept her off the starting line, in 2006. Although 2006 was Lornah’s final Peachtree, it was hardly the end of her career: The next year, she won the World Cross Country Championships and set a world record in the half marathon before competing in two more Olympics. After marrying Pieter Langerhorst, Lornah became a citizen of the Netherlands in 2003, but a big piece of her heart remains in Kenya. She and Langerhorst still manage the training center in Iten, which has expanded to serve runners of all abilities. When Grete Waitz made her AJC Peachtree Road Race debut in 1983, she had already won the New York City Marathon four times. She would end her career with an unfathomable nine victories, and it is the race with which her name is entwined despite being a five-time World Cross Country Champion and multiple world record-holder on the track. Just as the race changed her life – she had been about to retire when she was first lured to New York in 1978 – she changed the sport, helping reset the standard for how women were perceived as competitors. Instead, she caught up to the other women a mile or so later, and made her move on the hills to a course-record 32:02 victory. She tried not to think about how fast she might have run if she hadn’t fallen. In 1984, Grete was busy winning a historic silver medal in the first women’s Olympic Marathon, but she returned in 1985 to win in the identical time of 32:02. The next year, she competed with an injured hamstring so painful that she ran the last quarter mile with her eyes closed; it was her closest Peachtree win – by just eight seconds, in 32:12, over Marty Cooksey – but a win nonetheless. 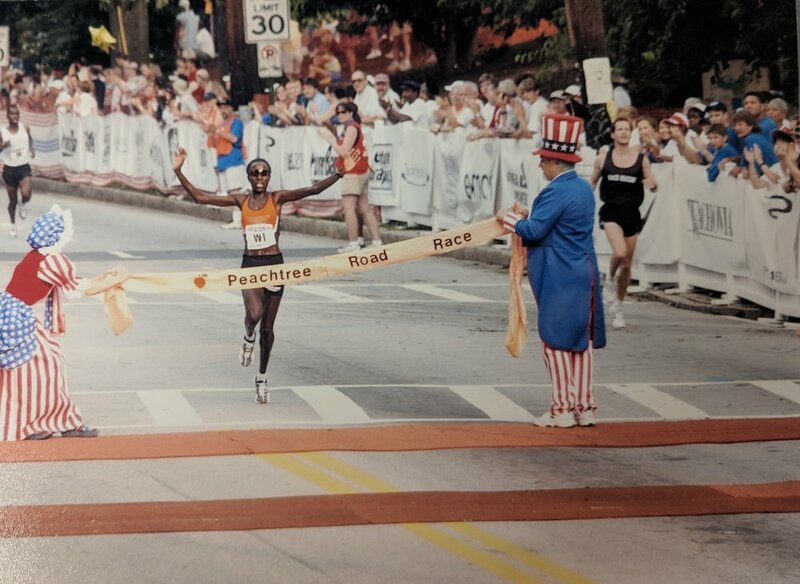 In 1988, she ran and won her last Peachtree, in 32:10. Four appearances, four victories. And many hearts. “She was immensely popular here,” according to Julia Emmons, longtime race director. In 1991, Grete was named female runner of the quarter century by Runner’s World magazine. A year later, she ran her last and most poignant marathon, 26.2 miles with longtime New York City Marathon race director Fred Lebow after he was diagnosed with brain cancer. Just 13 years later, Grete would receive the news that she, too, had cancer. In 2007, Grete launched the AKTIV Against Cancer after discovering how much better she felt during her cancer treatment if she continued to exercise. “It was like a big, big victory,” she said, of her first effort on the treadmill. Since its founding, the nonprofit organization has donated over $14 million to make physical activity part of cancer treatment. Grete died in April 2011. The story of triumph over adversity is as old as athletics, but 29-year-old Tatyana McFadden may define it. Born in Russia in 1989 with spina bifida, her parents abandoned her in an orphanage. With no medical treatment and no wheelchair, the little girl learned to walk on her hands amid the deprivation. When she was 6 years old, she was rescued by Deb McFadden, who had become U.S. commissioner of disabilities the year Tatyana was born and was on a business visit to the orphanage. After being adopted by McFadden and brought to the U.S., she wasn’t expected to live long. Instead, Tatyana’s adoptive parents put her into every sport imaginable at the Bennett Blazers, an adaptive sports program near their Maryland home, trying to make her stronger and burn off the child’s excess energy. At the age of 15, Tatyana became the youngest member of the 2004 U.S. Paralympic team. She won two medals, but came home to find that her high school wouldn’t allow her to compete alongside her able-bodied classmates. Tatyana endured ridicule and hostility during the battle, but the lawsuit filed by the McFaddens led to first the state and then the nation guaranteeing students with disabilities the right to participate in sports. Now a 17-time Paralympic medalist and a four-time winner of the Grand Slam of marathons – London, Boston, Chicago and New York in a calendar year – McFadden has become a beloved mentor to youngsters at races around the country. In addition to her hands-on tutoring of the next generation, Tatyana has written a children’s book, “Ya Sama!” (Russian for “I can do it!) that chronicles her life story. The 2015 Laureus World Sportsperson of the Year with Disabilities – the mission of the Laureus Foundation is to harness the power of sport to promote social change – Tatyana is also the most successful elite athlete in the Peachtree’s 49-year history, with seven victories. Fittingly for this fighter, her seventh Peachtree win, in 2017, came after a battle against blood clots that threatened her career and even her life. Looking back at some of the Peachtree greats who have also had success in the Big Apple at the New York City Marathon.